Pesto! I love its rich, pungent flavor. 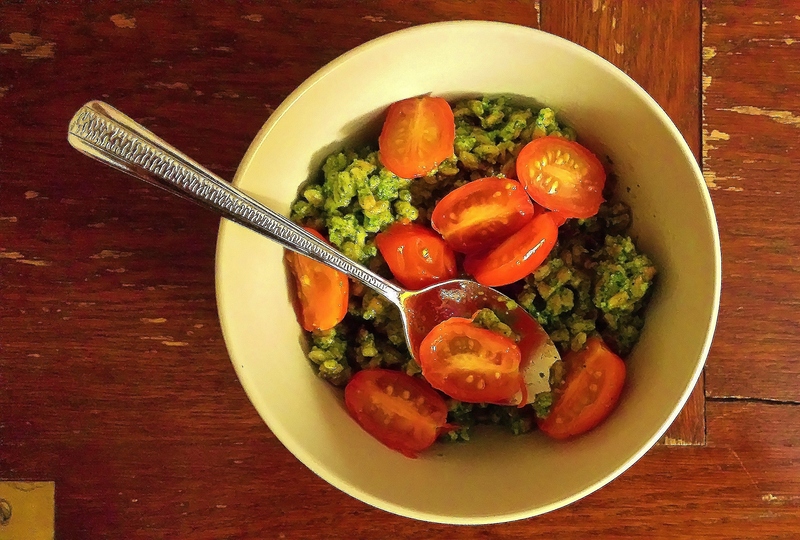 This was my first time creating my own pesto recipe, and I have to say, I was very pleased with the outcome. This pesto sauce is very rich and flavorful without being too strong-tasting. It was also my first time serving pesto with something other than pasta. I used precooked Italian farro, a whole grain with an addictively chewy texture, which worked perfectly as a pasta substitute (actually, I liked it better than pasta). Here’s to swapping whole grains for pasta carbs! The precooked farro was an easy way to go because I didn’t have to soak it first. I believe any farro grains not sold precooked need to be soaked overnight before cooking, which wouldn’t be difficult but would add another level of planning to the recipe. If you don’t have pine nuts, walnuts make a great substitute in pesto sauces; I’ve often used them instead since pine nuts are so expensive. However, I’ve been flush with pine nuts for a while now, ever since I bought a 16-ounce bag of them for about $20. I’d say going bulk like this with the pine nuts is the way to go if you’re going to buy them; it’s a much better deal. Cook farro according to package instructions. In a food processor or blender, combine parsley, cheese, pine nuts, olive oil, garlic, lemon juice, salt, pepper, and red pepper flakes until a smooth, sauce-like consistency has been achieved. Mix with farro and serve topped with halved grape tomatoes. Makes about four servings.